Naomi Mitchum�s advocacy began by writing books; she has published over 50 student books, teacher books, related resource kits, teacher enrichment articles, as well as many filmstrips and dramas. Her book, Harps in the Willows, was used in Salvation Army Counseling Centers after 9/11. Naomi has led her local church planning and creating awareness of the needs of people with disabilities. She organized a committee in 1995 that visits churches across Texas to help them become more accessible. She has taught over 40 classes at leadership schools and conferences covering accessibility and educational opportunities for people with disabilities. Naomi has worked with organizations to improve and coordinate transportation, select an appropriate voting machine, organized recreational and religious groups t meet special needs, participated in panel discussions and working in the community with parents to promote disaster preparedness. In 2005, Dr. Peacock established the Baylor College of Medicine Transition Medicine Clinic (TMC) to offer medical home to adolescents/young adults with chronic childhood illnesses or disabilities which helps to address the problem of aging pediatric population needing to move into the adult health care system. Dr. Peacock found funding to hire social workers for the TMC to help connect needed local community resources to this special population of patients. She has also devotes numerous hours to Advocacy, Inc. getting nursing services available for patients with disabilities with the goal of keeping them in their community with their families. In 2009, Dr. Peacock developed a legislation that addressed the issues surrounding health care transition of this special population of patients, which was presented to the 2009 legislative session. Additionally, Dr. Peacock worked with other colleagues on Texas House Bill 1230 that addressed supportive employment for adolescents/young adults with a disability. In 2009, TMC served 228 unduplicated patients, ranging in age from 17 to 52. In total, the clinic has provided care to 500 adolescent/young adults with a significant childhood illness or disability. 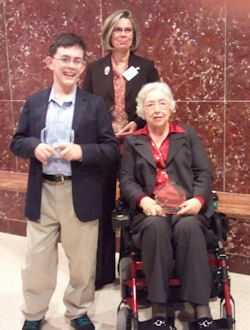 Three years ago, Matthew Stephenson was inspired to raise money for the United Cerebral Palsy of Greater Houston (UCP). Matthew�s decision to support UCP was based on the fact that they are on the only organization in the Greater Houston area providing comprehensive services to individuals of all ages with any type of disability and their families, over 65% of whom are below the poverty level. At age 9, with the help of friends and family, Matthew was able to raise almost $3,000 for the United Cerebral Palsy�s High School High Tech Program, which helps high school students with disabilities graduate, get internships, and go to college. After the success of this campaign, Mathew decided to go bigger and told the staff at UCP that he wanted to raise $30,000 in one year. It was a big goal, but Matthew was determined to accomplish it. And he did! Matthew continues to speak on behalf of UCP and continues to advocate for its mission everyday. Matthew�s giving spirit and charming attitude touches the hearts of everyone he meets. Matthew is an amazing kid with a perseverance for helping everyone with disabilities. Matthew will kick-off another year of fundraising very soon is hoping for an even more successful turnout.